If you need to locate your Exmark model number and serial number, we can help! Find your Exmark equipment below to see model and serial number locations. The model and serial number plate on an Exmark zero turn is located under the lever on the right hand side, as shown in the image. Other places that the model and serial number plate could be located on an Exmark zero turn can be on the right side under the fuel tank, behind the operator seat, or on the right side of the operator console. Find your Exmark Zero Turn Parts. 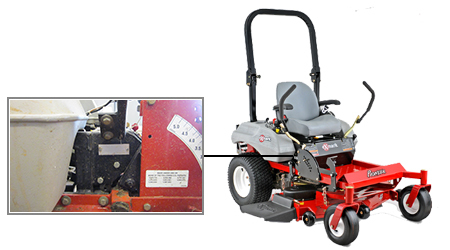 The deck on a walk-behind mower would have a separate serial and model number sticker that would be located on the support pin gusset, on the right hand side of the deck. Look up your Exmark Commercial Walk Behind Mower Parts.